A number of well-known authors, as well as some of those involved in setting up Turkish baths in the British Isles, had visited a hammam in Turkey or in the Maghreb. The descriptions they wrote were frequently either flowery, revelling in the exotic, or humorous, concentrating on features of the bathing process calculated to raise a smile if sufficiently exaggerated. In total contrast, the letter which follows, was written in 1855 to his father, by Armand Temple Powlett, a young lad based in Turkey at the time of the Crimean War. We do not know which hammam is being described in the letter, but it seems likely that a young man would probably go to a fairly small, less expensive one. 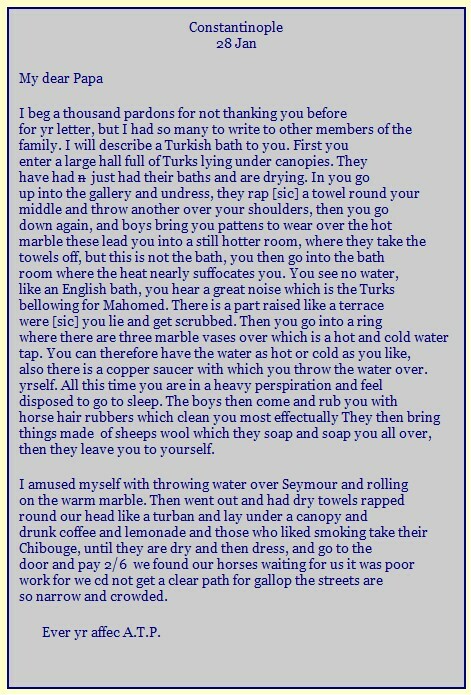 The whole of the letter, one of a collection in the Powlett Papers, describes his first visit to a Turkish bath in simple unsophisticated language which is neither designed to make converts nor poke fun at customs unfamiliar to the intended reader.